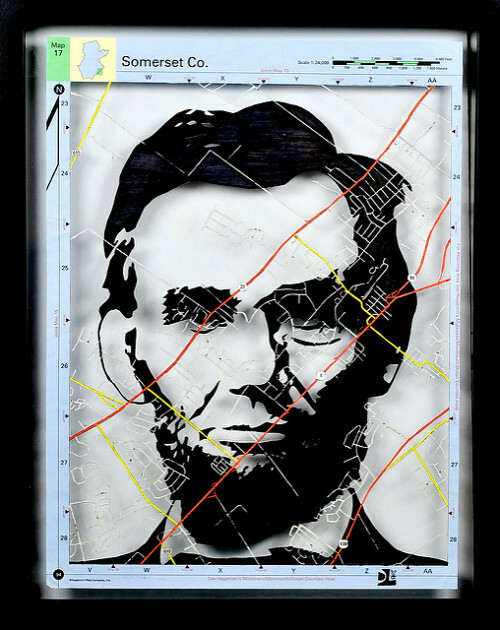 Portrait artist and paper cutter Dan Landau of Dan Landau Art in New Jersey is this week's featured artist. 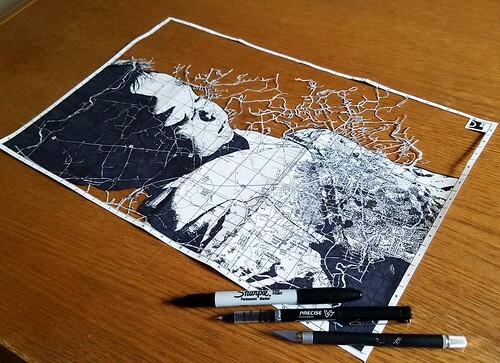 Dan creates really interesting pieces in which he draws a black ink likeness on a site-specific map and cuts the map precisely around portions of the image, resulting in a layered effect. Welcome Dan! 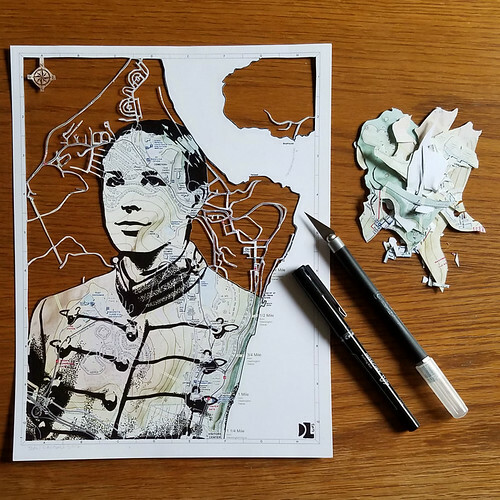 Tell us how and when you began creating your mixed media paper cuttings. 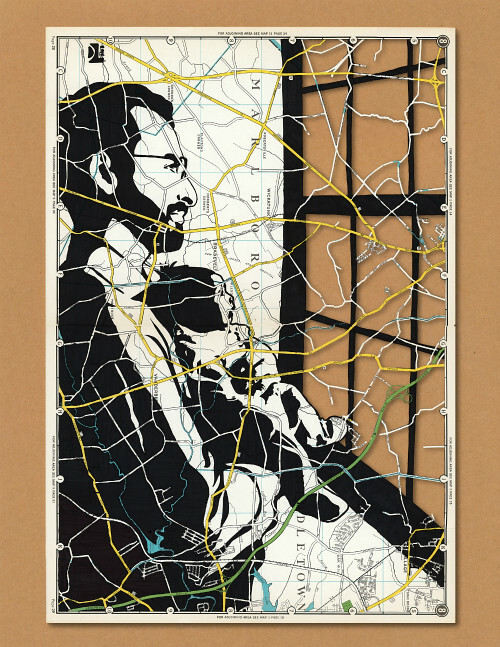 I started making my paper cuttings when I was in graduate school just a few years ago. At the time, I was enrolled in an online master's program while working full time in a university communications office. Both my day job and classes required a lot of screen time and so I wanted to make something physical -- something I could see when the power went out, unlike the writing work I did at work and in school. I saw someone draw on a map once and thought it was a cool idea... I tried it out and made the style my own. When it comes to art, I am mostly self-taught. I learned through observation and experimentation. I have been doing drawing and paper cutting for about five years now and before that, I was a freelance photographer for nearly ten years. I credit my experience as a photographer for my knowledge of composition and lighting. Outside of art, I have master's degrees in management and corporate communication from Fairleigh Dickinson University in Madison, New Jersey. The cliched but true answer is because I have to, just like breathing. It brings me great satisfaction to create art and express my creativity this way. I really enjoy paper cutting in particular, because besides being rather unique, it’s a very slow art form. Making paper cuts requires a tremendous amount of patience as well as a steady hand. Practicing paper cutting is like meditation for me. Tell us about your favorite tools and paper. I use a variety of craft knives, but Excel Blades' knives and #11 blades are my favorite cutting tools. For drawing, I mainly use black Precise V5 and V7 pens from Pilot Pen and black Fine and Ultra Fine Sharpie markers. 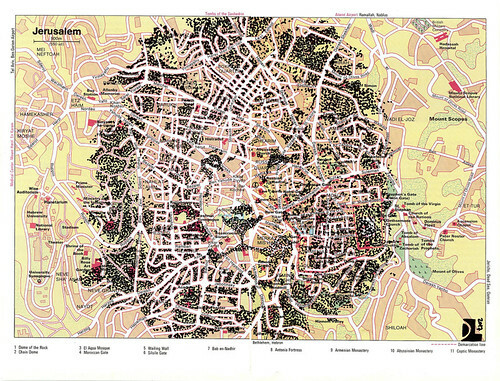 I don't have a favorite paper, but I have found that very old paper maps and maps printed with a glossy finish (like magazine pages) to be rather difficult to work with and I try to avoid them. I noticed quite a few commissioned portraits of West Point cadets via your Instagram feed (@danlandauart). How did they come about? My brother is a cadet at the US Military Academy at West Point (Go Army!) 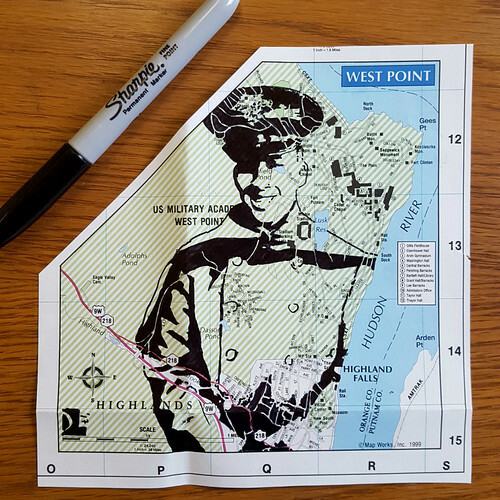 and I drew a portrait of him on a map of West Point. Soon some West Point parents saw his portrait posted on Facebook, and they all wanted their own cadet sons and daughters drawn. I drew more than thirty commissioned portraits of West Point cadets last year. Tell us about your process... as with the one above, not all of your portraits involve paper cutting. That's right. All of my map work involves drawing something directly on the map. 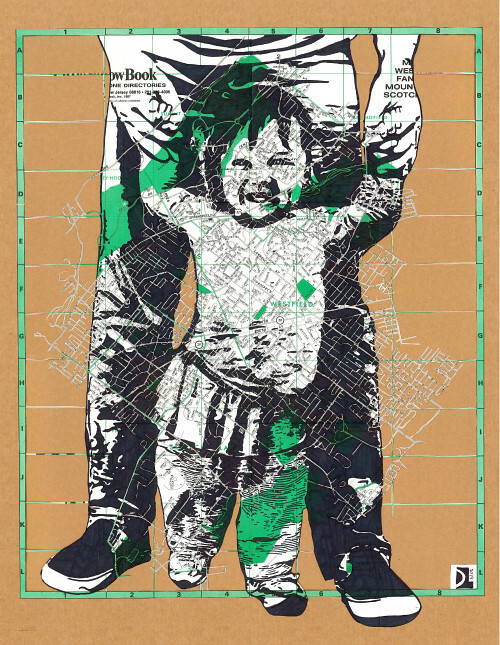 With the West Point cadets, one of the portraits was a drawing and cutting combination, but the rest were ink drawings on maps of West Point without any cutting. My preferred method, and the one I use for most of my non-commissioned work, is to draw directly on the map and then cut away the paper around the drawing. Sometimes I do more traditional paper cutting without maps... in those cases, I don't have a favorite paper -- almost any kind of heavy paper will do. I've used card stock, watercolor paper, matte photo paper, and all work well. Do you have any upcoming exhibits or future art plans? I have a couple of shows in the works for later this year, so please keep an eye on my Instagram feed or via Facebook (Dan Landau Art) for updates and to see in-progress shots of my work. I am hosting an international Instagram giveaway for The Rare Orchid, a U.S. online shop that imports a beautiful array of Japanese chiogami paper and washi tape, February 6-8, 2018. Easy entry: like and comment on the Instagram giveaway photo. Visit The Rare Orchid to see all that is available in the current Pre-Order Sale.